Dark Avorian wrote: Well, this be hilarious. Reckoning + insanely active thread = bababam! FFS Cueball, do something! It's not like you're stuck in a desert for eternity, where sand and rocks stretch to infinity... or something. Last edited by Sappharos on Fri Mar 29, 2013 12:34 pm UTC, edited 3 times in total. It appears that Cueball has finally bridged the two castles together: his two past lives with Megan. But now that they are bridged together, will Cueball and Megan reconcile? Where is she? Whelp, time to go. I have outsider things to do, like sleeping. Stay strong, fellow Timewaiters! We hold the power of the polls now, but the Americans wake in only a few time frames! Cueball will slip down and destroy quite a part of the castle. Nobody trust Cueball after his first accident. So maybe we bet-ter change to Dutch? Assuming "Dutch" is actually what he said. Who knows? I partook of my much needed coma for 11 newpix and returned to find I had slipped backward in time by about 10 newpages. Cognitive dissonance threatens to overwhelm me as I experience your past as my present, but the portal is misaligned. I am pushing the engines to the redline to try to catch up through the vortex and rejoin the present. Could someone send up a flare? I hope this message makes it to the future intact. woo finally awake! I did try to "catch up" reading old post, but this is clearly more and more difficult with the word change, also because I feel like we need more people voting http://strawpoll.me/12599. As a long time lurker of the forums I have seen this behavior (the word-changing scheme) before from mods, but now that there are so many new users and this tread is on the verge of total madness (m_a_d_n_e_s_s) and nonsense it would be fun. I have to eat and shower and other outsider stuff.. but I will be back, to keep watch, to wait, to be. That's a very good point. I think the poll has this word all wrong. Newpixians be a geographical terminology, as newpixia be the island of sand where we eat dutch apple pies made out of bananas. wow... This be sparta... i mean Reckoning. Aybemay Iglatinpay ouldway ebay ethay afestsay ayway. Time Waiters is overthrowing Initiates of Time by 11 votes. If this is still the case ~4 TimeFrames later, I suggest change the wiki. Last edited by GeoffreyY on Fri Mar 29, 2013 12:57 pm UTC, edited 1 time in total. Time Watchers be overthrowing Initiates of Time by 11 votes. I however need some advice: as of tomorrow, I am on holiday for a whole week, on a canal boat, somewhere in the North-West of England, where I will have very limited access to the Internet - there will be access to only a single power socket and one tablet with tethering/3G capabilities, spread between about 8 of us. Given the speed of posts on this forum, how do I keep up, without causing serious disputes with my family? 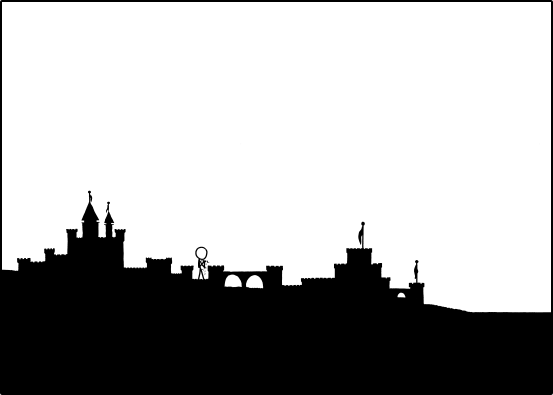 As for my theory: we will soon be zooming out again to see a third castle on the left. Megan and Cueball will finish it and then leave to the left again. Repeat recursively until we are so far zoomed out that we can't actually see Megan and Cueball, and then later the castles. At this point it will be safe to stop posting updates as it will be impossible to determine differences. Or raptors will destroy them all. Are you sure you don't mean "Waiters"? Oh, great. What (w-h-a-t) just started changing, too. Wait, what? I mean, w-h-a-t? Old English now? P.S. It even affects PMs. That's nasty. digimuzik wrote: Oh, great. hwæt (w-h-a-t) just started changing, too. Our only hope is for us all to start using Klingon. Due to the target audience of this comic, it has a higher likelihood of being spoken by all parties than the previously suggested Dutch (though I will accept that as a second option). What do you mean. This. Is. MADNESS. Time Waiters is 19 votes ahead of Initiates of Time now. Edit - reversed earlier edit adding something that someone else added while I was editing. Last edited by gorn on Fri Mar 29, 2013 1:04 pm UTC, edited 2 times in total. Grepus wrote: Wiping sand from his hands... A job well done, perhaps? Or arms folded, contemplating what bit to upgrade next. I however need some advice: as of tomorrow, I be on holiday for a whole week, on a canal boat, somewhere in the North-West of England, where I woll have very limited access to the Internet - there woll be access to only a single power socket and one tablet with tethering/3G capabilities, spread between about 8 of us. Given the speed of posts on this forum, how do I keep up, without causing serious disputes with my family? As for my theory: we woll soon be zooming out again to see a third castle on the left. Megan and Cueball woll finish it and then leave to the left again. Repeat recursively until we be so far zoomed out that we tin't actually see Megan and Cueball, and then later the castles. At this point it woll be safe to stop posting updates as it woll be impossible to determine differences. Or raptors woll destroy them all. Probably best to convert the others on your way to the boat. Or arms folded, contemplating hwæt bit to upgrade next.